Can New York’s immigrant farmworkers get legal driver’s licenses—without handing their information over to ICE? 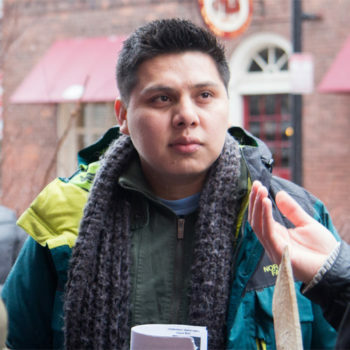 On March 12, Victor Cortez, an undocumented immigrant and organizer with farmworker justice organization Alianza Agricola, recalled a day when he was injured while working on a dairy farm in upstate New York. “When I wanted to go to the doctor, I couldn’t go, because I didn’t have a driver’s license. I had to deal with the pain that night and another night, too,” said Cortez, standing before a crowd in a packed theatre in Albany, New York. Cortez was one of close to a thousand immigrants—many of them farmworkers and their families—who had traveled from all corners of the state to rally and meet with legislators in support of passing a bill—the Driver’s License Access and Privacy Act—which would allow New York residents to register for drivers’ licenses regardless of immigration status. 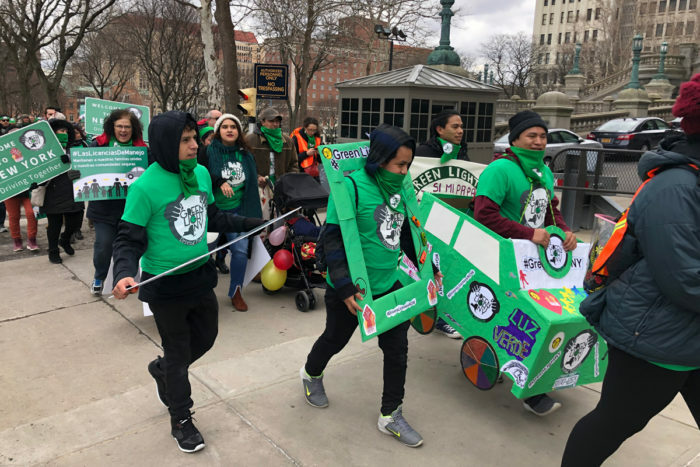 The New York Immigration Coalition recently announced it was putting $1 million into the campaign, and several groups from across the state—including Make the Road New York in Long Island and the Worker Justice Center of New York in Rochester—have formed a coalition called Green Light NY. “It is my job as a sponsor…to make sure that this bill becomes law this year, and I pledge to you that I will fight…for you,” said state Senator Luis Sepúlveda, addressing the crowd at the rally earlier this month. The campaign in New York is part of a larger movement that has been picking up speed across the country, and it’s being seen as a crucial way to provide farmworkers and other undocumented people with more agency, mobility, and rights. Twelve other states and Washington, D.C. now allow residents to obtain licenses regardless of immigration status, and nearly all those policy changes went into effect within the last five years. Similar campaigns to pass legislation are currently underway in Wisconsin (backed by the Wisconsin Farmers Union) and Michigan, and legislation was also introduced in New Jersey at the end of 2018. This movement has grown against the backdrop of increased immigration-related arrests and deportations under President Trump, however, and a New York Times investigation published last week found that immigration crackdowns are increasingly affecting New York’s farmworkers and farmers. As a result, New York lawmakers are working to build privacy protections—such as safeguarding personal information collected from immigrants—into the proposed bill in their state. Groups in other states are working to add such protections into their laws retroactively. Immigrants, many of them undocumented, play a major role in America’s food system. They make up a large part of the workforce in industries like meatpacking, food service, and, most significantly, agriculture. While exact numbers are hard to find due to the nature of their undocumented status, the USDA estimates that about half of the country’s hired farmworkers are undocumented immigrants. (Many groups that work directly with immigrant farmworkers believe that number is much higher in reality.) Dairy farms in the Northeast are particularly dependent on immigrant labor. In an emergency, Fox added, workers are often reluctant to call 911 due to language barriers and fears that local law enforcement collaborates with the U.S. Customs and Border Protection (CBP) (the agency is active in New York because of the proximity to the Canadian border) or ICE. An underground network of drivers called raiteros help workers get around, but Fox and Cortez both cited their exorbitant prices (which can range from $50 to $100 for a short trip to the store) as further obstacles to unlicensed workers’ mobility. Enrique Balcazar is originally from Mexico and now lives in Burlington, Vermont, where he is a leader at Migrant Justice. He said he worked on four different dairy farms over the years, where he was often expected to work long hours at below minimum wage, sometimes for seven days in a row. “On top of all of the challenges of the job, you couldn’t leave the farm to go to the bank, to go to the store and buy food, or if you have children, to bring your kids to school,” said Balcazar. Of course, many opponents of driver’s licenses for immigrants see events like those as positive, arguing that those who are not authorized to live and work in the U.S. should be detained and deported. For example, in New Jersey, about 20,000 people have signed an online petition against driver’s licenses for undocumented immigrants. “When New Jersey enforces its regulations, codes, and laws against businesses and homeowners, but yet on the other side of the coin will completely ignore that somebody broke the law to come into the country and give them these benefits, I think it’s an outrage,” state Senator Chris Connors told NJ 101.5. 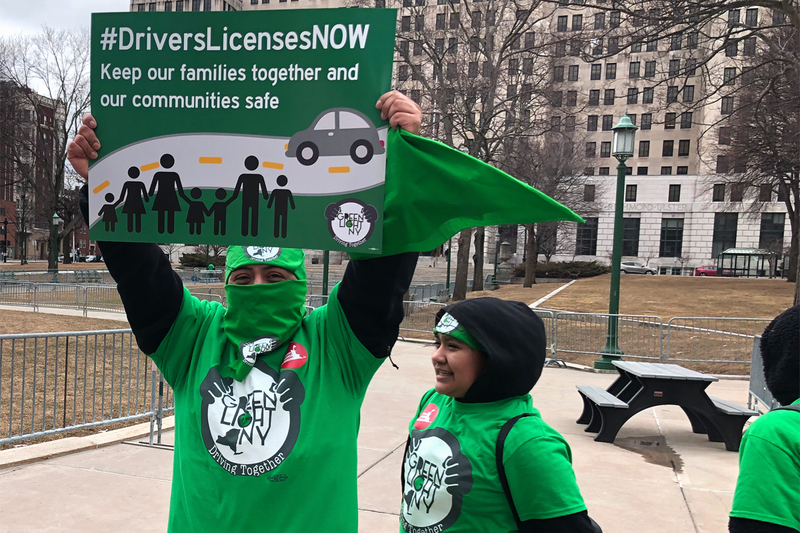 However, advocates say licenses for immigrants would benefit American citizens by making roads safer, since immigrants who are already living and working in the country would be required to take and pass drivers’ tests. It would also boost the economy, some argue. A 2017 report compiled by the Fiscal Policy Institute found that if the proposed bill passes in New York, an estimated 265,000 unauthorized immigrants would get licenses, resulting in $57 million in combined annual government revenues from sources including license plate fees and car registrations. While those numbers sound high, evidence from other states suggests they’re not out of the question. In Maryland in 2014, more than 13,000 immigrants applied for driver’s licenses within the first two days of the new law taking effect. Vermont’s law creating “Driver Privilege Cards” (DPC) for residents without Social Security numbers also went into effect in 2014. A little over a year later, a reported 40,000 people had obtained a DPC. But on March 17, 2017, that all changed. Balcazar was arrested by four undercover ICE agents as he left Migrant Justice’s office and was detained. He was released after 11 days, but is still in the midst of deportation proceedings. At least 20 members of the Migrant Justice community have been arrested, and the pattern prompted the organization to look into why. After obtaining lawyers and requesting documents, they discovered that the Vermont DMV had been sharing information from DPC applications with ICE. In November, members of Migrant Justice, including Balcazar, filed a lawsuit against ICE and the DMV alleging that, “DMV has had a long-standing policy, pattern, and practice of permitting its staff to routinely and regularly share information with ICE and Border Patrol and to actively seek to facilitate the immigration enforcement activities of those two agencies.” The behavior they documented included responding to requests for information from ICE, but also opening investigations and contacting ICE solely on the grounds that an application had a Latino last name. Meanwhile, in Washington, the Seattle Times discovered that after the state began allowing undocumented immigrants to obtain licenses, the Department of Licensing shared personal information with immigration authorities 20 to 30 times per month, resulting in the detention of several individuals who were targeted because they used foreign documents for identification. In other words, it’s no accident that the word “privacy” is central in the title of the New York law. 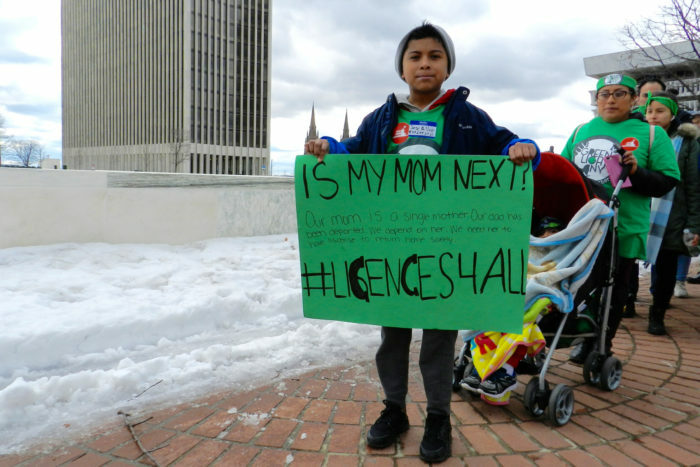 “We want to make sure that as we’re talking about expanding access to driver’s licenses, we’re also taking a look at how the DMV safeguards the information it records and collects from people,” said Zachary Ahmad, a lawyer with the New York Civil Liberties Union, which provided input on the provisions in the New York bill. To that end, the bill includes specific stipulations related to how long information can be retained (for instance, applications for standard driver’s licenses that have already been reviewed may be destroyed after they’ve been on file for six months) and how and when third parties can access the DMV’s database of information. Photos © Lisa Held, except where noted. Very interesting topic. To me it comes down to 2 things. If the US wants to maintain cheap food labor there needs to be a federal law to cover these people allowing them to come in documented so they can come and go based on seasonal work since ICE is Federal. And what about auto insurance? If there is an accident then this person disappears or doesn’t have insurance who will pay for the damage and or injury. Both are serious issues that need Federal attention.